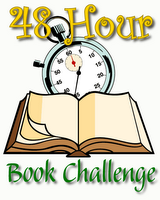 It's the Fifth Annual 48 Hour Book Challenge! Yes, the original mega reading channel, brought to you by that energizer bunny of bloggers, MotherReader. Go, read the details at MR's blog. Basically, pick your 48 hours during the weekend of June 4–6, 2010. Read and blog away! Sign up now! I know I won't get a full 48 hours in but I hope to do at least 24-30 if I can. I'm excited to participate. Good luck to you if you're participating too.